Treasure Garden has the perfect umbrella for dining al fresco at a sidewalk café or the neighborhood coffee shop. In fact, Treasure Garden has the perfect umbrella for any outside dining venue, whether it is a restaurant or right next to your backyard grill. 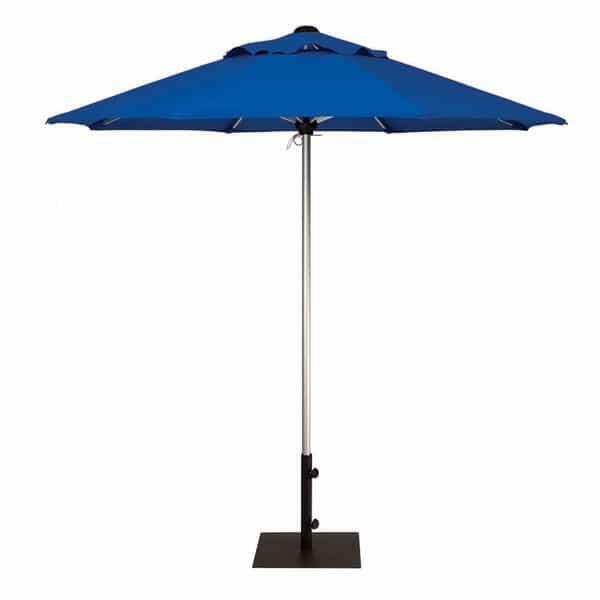 The 7.5 Ft. Commercial Umbrella is the right size for any bistro or small dining table. Even better, this umbrella is made to take all the use and abuse typical of a commercial venue. The 7.5 Ft. Commercial Umbrella by Treasure Garden features a single, thick-walled 1.5” aluminum pole, which is rust and maintenance free. The pole is further protected by one of two exclusive Treasure Garden powder-coat finishes; Silver Shadow or Black. There are no cranks, buttons, wheels or cords to worry about; the 7.5 Ft. Commercial Umbrella has a practical push up lift and is held securely in place with a stainless steel pin. This umbrella comes standard with a single wind vent to discourage fly-a-ways and wind damage. Accessorize your venue by choosing one of Treasure Garden’s wide array of Sunbrella’s high performance fabrics for your canopy. Those bright and vivid colors and patterns are warrantied for 5 fade free years. The 7.5’ Commercial Umbrella canopy also provides your guests and patrons with 44 sq. ft. of comforting shade, encouraging them to enjoy their outdoor dining experience. Top off their coffee and bring out the dessert cart; they aren’t going anywhere!